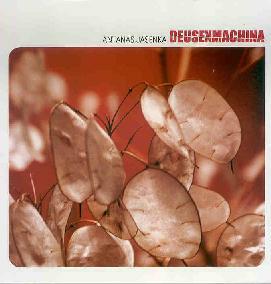 Antanas Jasenka - "Deus Ex Machina"
Lithuanian composer Antanas Jasenka's works have been performed extensively on radio and festivals, and he has taught music composition in his home country. On Deus Ex Machina, Jasenka presents an electro-acoustic journey that is quietly subtle but elusively varied in it's development and execution. Jasenka moves from slow melancholy passages to futuristic bleeping cosmic engine rooms, all the while dabbling in avant garde ambient and noise constructions. Spacey atmospherics and image inducing soundtrack stylings quickly transition to dense noise assaults, dramatic avant-classical movements, and a parade of experiments in sound and aural mood manipulation. Excellent spacey sounds, some ambient and many quite harsh, make for a menacing sci fi soundtrack and sometimes fast action upside-down video game chaos. I really dig the last section of the CD which has a kind of Aphrodite's Child "Killing Of The Beast" theme, though far more understated in it's intensity. The aliens are approaching... and they may not be friendly.